Egg Poach Curry is a simple egg dish that takes hardly 15-20 minutes to prepare. It's one of my favourite cause when am not in a mood for cooking anything with elaborate preparation, this dish kicks in to help. 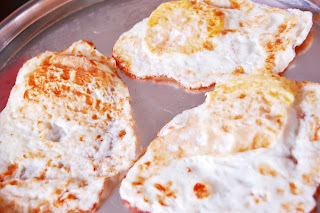 However, what you ought to be careful about during the preparation of this curry is just make sure that when you flip over the poach to fry it on the other side, the yolk doesnot break. This is the most tricky part of all. If you can manage this, preparing the curry is as easy as drinking a glass of water. 2) Now heat ﻿oil in a frying pan. When the oil turns smoking hot, slide in 2 dry red chillies and black mustard seeds. Once they start spluttering, add the onions and tomatoes and fry them till they turn translucent. 3) Now add ginger paste, green chillies, coriander powder, cumin powder, red chilli powder and turmeric powder. Mix well and saute for 2 minutes. Add salt and water as per your requirement for gravy. When the gravy starts to boil, add the fried egg poaches and simmer for 1 minute more. 4) Serve hot with rice.